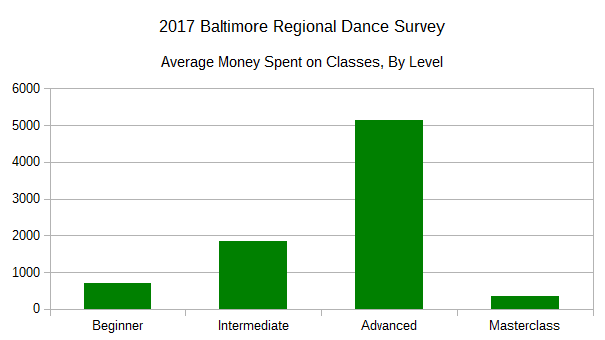 When asked, “Approximately how much did you pay for classes in total in 2016?”, 49 respondents answered this question. 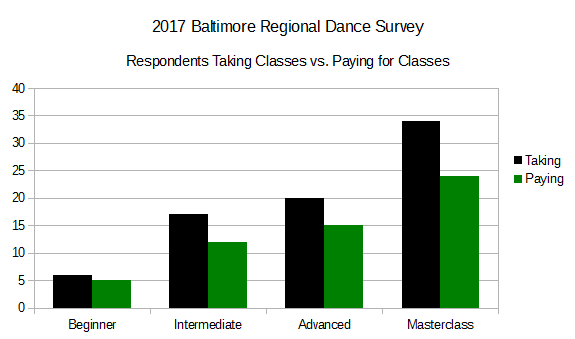 36 Respondents spent some money (13 indicated no spending on classes during 2016), and about half of those spent money at the Masterclass level. 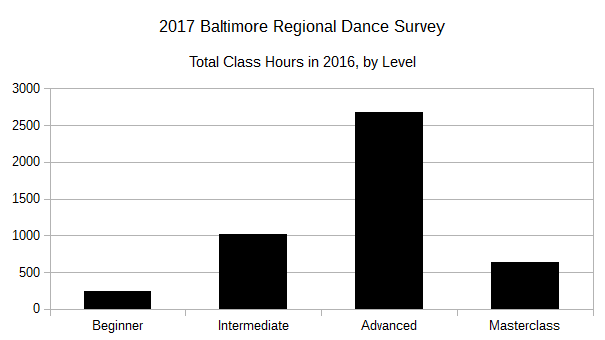 From previous data, we know that there are very limited hours at the Masterclass level, and we also know that the BRDS sample is biased toward more experienced dancers. So, let’s look at some dollars. 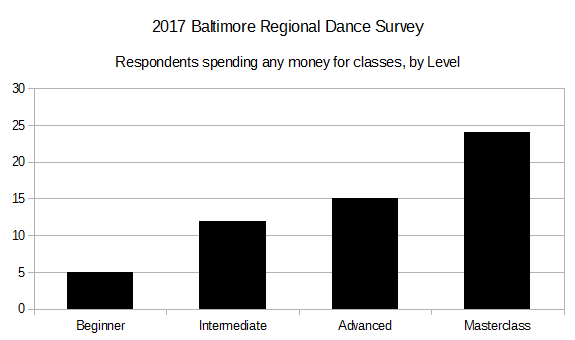 Among the 50 respondents answering this question, 36 indicated they paid some money on classes, and the total for the group is $110,813, or $2261 per respondent (counting the respondents that spent no money). 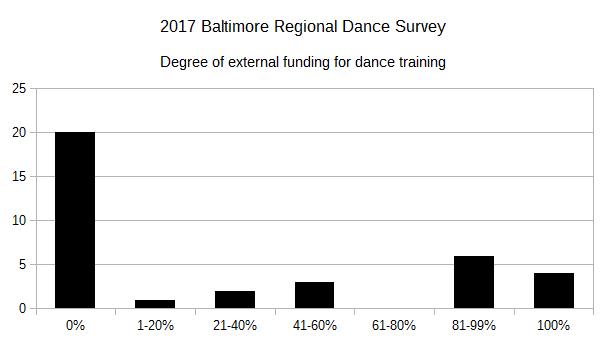 Keep in mind, BRDS survey respondents are biased toward the more experienced dancers, but $2261 is almost $190 per month. 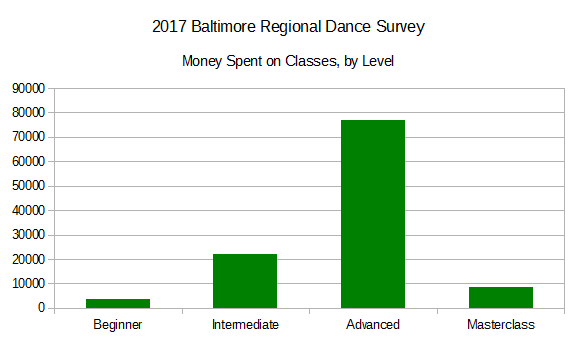 I do realize that it’s a bit of a challenge to review a whole years’ worth of spending, break it down into four newly-defined categories, and come up with some meaningful number. There is probably a wide variation in accuracy from respondent to respondent (depending largely on how seriously the individual engaged the survey). And the sources of those external funds? Parents (5 Respondents), Employer (5 Respondents), Company Classes (3 Respondents), Barter (3 Respondents), Grants (2 Respondents), Scholarships (1 Respondent).